After playing Final Fantasy Record Keeper and nothing else for a month straight, I decided that with a ready PS Vita and no HDMI enabled TV (what is my life? ), it was time to hit the backlog of games on my PSN account. I've always promised myself that I will play all of the Final Fantasy games someday, as it is the series that got me into video games and more specifically, JRPGs. With this in mind, I decided to hit Final Fantasy IX because I heard the story is really interesting and since Kingdom Hearts, I've wondered what on earth even is Vivi (he is a Black Mage by the way, which I should've guessed). 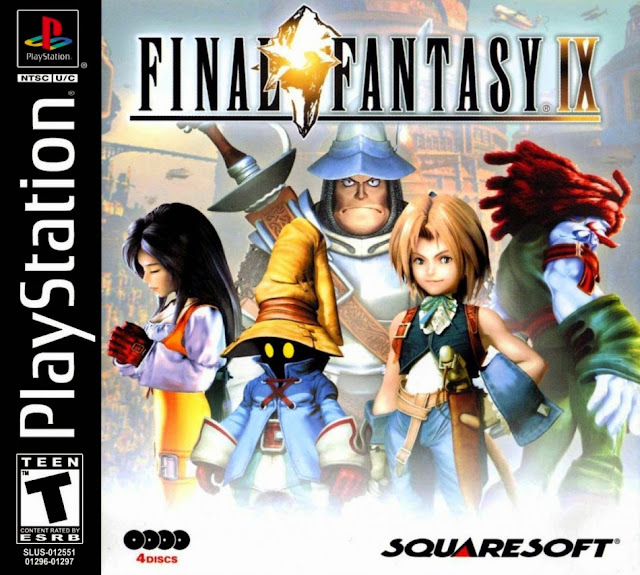 Playing a PS One Classic really made me think about how much they differ from both RPGs and JRPGs of now, so here are a few things that were running through my head throughout the beginning of playing Final Fantasy IX. For the record, I'm still playing and loving the game, but I'm sure I'm up for at least another 100 hours of gameplay. And I'm so keen. Saying that a PS One Classic's visuals are terrible compared to the PS4 or even PS3's graphic capabilities is pretty darn obvious, but it was the first thing I noticed and took some time to get used to, initially putting me off continuing the game for more than five minutes at a time. Even with Final Fantasy IX's cinematic cutscenes, for it's time Final Fantasy IX's visuals were of a high quality and are simply dated because the PS4's cinematic visuals have of course improved thanks to time. Upon booting up Final Fantasy IX, I see lots of blocky, spikey graphic textures and I have trouble finding treasure chests because everything on the map sometimes blends together, but as with anything, you do get used to it and this is likely why we had no problem with those visuals at the time of it's release. I've come to accept Final Fantasy IX's charming spikey visuals and 10 hours later, I have no problem with them. This Game Is Longer Than Most Games I Play Now...And I Love It. I remember playing Lightning Returns: Final Fantasy XIII around this time last year on a very tight work schedule and completing it in around a month. It was a good experience, but when I think back to that game, it's almost like a blur. Even though 30-40 hours of gameplay is a decent amount of time and definitely still a longer game when compared to games such The Order: 1886 or Metal Gear Solid: Ground Zeroes being mainstream examples of shorter games, I've been playing Final Fantasy IX for about 10 hours and I can tell I've barely scratched the surface on the main story and I've just started to get to know the characters. Of course longer games do exist today (Persona 4 Golden being one of my favourites of all times) and maybe this is personal taste, but I love the slow pacing of Final Fantasy IX so far. It feels like I'm actually getting to know the characters at a normal pace and I'm already seeing characters like Steiner who originally annoyed me begin to grow on me. JRPGs are known as a longer genre because of games such as Final Fantasy IX and it's because the stories in this medium are usually good enough to keep someone involved for that long. Oh man. There is nothing like trying desperately to find a save point to use a healing while your characters are on extremely low health and you're out of both Phoenix Downs and Potions. The tension! Save points may provide a challenge to more sadistic gamers who don't mind playing through levels again and again, but personally I seem to have the kind of luck where if I'm low on health, I run into the rare area enemy that can kill all my characters in one hit. The good thing about modern RPGs is you can either save at any time or save points are extremely frequent, so I don't lose an hours gameplay because the next Save Moogle is extremely far away and hidden by long cutscenes. I remember when Final Fantasy XIII was released and it looked more like I was playing a movie than I was a video game. With high quality visuals in modern Final Fantasy and the mainstream RPG Destiny, it sometimes feels like RPGs are something else entirely to what they were in the PS One era and that with all the polish, they lack charm. But, there is hope. JRPGs are evolving too, with games like Persona upgrading their visuals but still keeping that JRPG quirk. Or games like Danganronpa who keep a minimalist approach so that the story can still shine. Final Fantasy IX definitely has a story worth experiencing. I will admit I'm yet to get to the magical JRPG twist or story hook that means I can't put my Vita down yet, but I'm still enjoying this trip back into the PS One era. If there's one thing I can say about this PS One Classic is that it's reminded me that good gameplay can make low level graphics blend into the background of a good experience. Hopefully I think the same thing after 100 hours, but for now, I'm loving this trip down memory lane. You can purchase Final Fantasy IX digitally from the Playstation Network Store. Got a PS One lying around? You can pick up the original PS One game or some sweet Final Fantasy IX from Play-Asia. What are your favourite PS One Classics? Would you revisit your favourite old-school JRPGs or are you happy enough with the current selection? Note: This article does contain an affiliate link. You can read our Affiliate Link Policy here.